Greetings traitors, heratics and aliens! 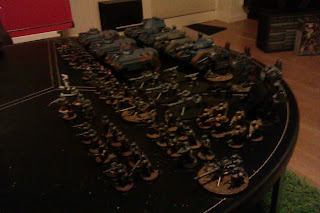 This week it was time for the 201st to reenter the battlegrounds of WH40k after a well spent holliday. I first went of with a battle against Krilles Necrons. The senario was standard pitched battle with 5 objectives. The battle started with the necrons unholy witch casting an unpenetrable cloud of darkness over the battleground making the elements from the 2nd Cadian armoured division and the 43d Cadian mobile artillery detachment unable to shell the steellike aliens down back in there holes. The Necrons advaced on both the Cadians left and right flank while the Cadians made a quick blitz maneuver with mechanised infantery in the centre, trying to break the spirit of the possessed robots. But as they advanced through the dustfilled wastelands of the battlefield their eyes caught sight of the terrible might of the enemies strengh. A gigantic moving struction with terrible firepower blocked their way... A monolith! It was in this darkest of times for the 201st that the captain led his men armed with meltaguns to the very foot of the monolith and with the combined firepower of the squad was able to stop the terrible structure. Now the tide was turning in the centre of the battle. Those that was left of the brave gardsmen was killing of the last of the necrons when terrible news reached the captains comlink inplants. The Necrons had cruched the Cadians left flank and the smoke of the burning Leman Russ ones protecting the flank cought the captains sight. Things where not looking good on the right flank either. The scout sentinels acting forward sentries had been taken by supries by a swarm off small Necron drones and were destroyed before being able to warn the Cadian main force. The artillery hadn´t stand a chance and now the Cadian reserve was cought in a desperate hand to hand fight with the overwhelming necron threat. The captain made a quick decision and turned what was left of the Cadian centre to face the threat from the left. A terrible creature swinging a gigantic warscythe was wreaking havoc amongst the guards. Many guardsmen layed maimed around the beast when a newly arrived Karskin squad was able to put it down for good. On the right flank the combat was fierce but with their last efforts and drops off blood the guards were able to halt and repel the Necron advance. For the first time in the battle the Necrons attack was stoped. The captain considered a counter assult but qickly realized that the men still standing were too few and too tired to carry on. When the night fell over the bloodsoaked battlefield that evening the two armies were licking their wounds and building up their strengh to fight another day. The battle ended as you might have guessed with a draw. I played two more battles but i wright about them another time. 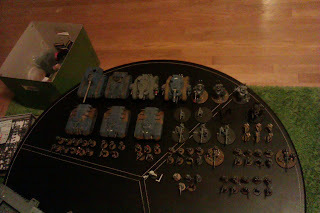 Unfortunately there were no photos taken during the battle but I add two pictures of my 2000pts army under construction for a fight against marines to compensate that! A fine day. But next time your weak humans will be exterminated! You are a good author! Makes me want to play. Apoc soon!!!! Thanks mate! Me want apoc too! Maybe round feb-march is a good time. Then I hopefully have about 2500pts painted!